Introducing Wotzinurfood Genuine Japanese Nattokinase plus Extra Vitamins and Minerals which is designed to keep your blood flowing properly and to protect against free radicals which can block arteries, and to reduce conditions and diseases associated with poor heart health. Natto, a traditional Japanese food made by fermenting soybeans, has been a popular and nutritious food in Japan for over 1000 years and some believe is one of the reasons for the low rate of cardiovascular disease in Japan, even though they are some of the world's biggest smokers. Nattokinase is a digestive enzyme produced when soybeans are cultured with Bacillus Natto. This nattokinase is separated and extracted from Natto. It's used as a natural alternative medicine, as a blood thinner, blood clot dissolver and is sometimes recommended as a substitute for taking daily aspirin. Nattokinase was discovered by Dr. Hiroyuki Sumi while conducting research at Chicago University in 1980. It has been subjected to 17 scientific studies and has been shown to have 4 times greater fibrinolytic activity than plasmin, and shows great promise as a natural way to support a health blood circulatory system. Nattokinase supports the body's production of plasmin (the naturally occurring enzyme in the body that breaks down fibrin, the enzyme that causes blood clotting) and helps blood flow. Nattokinase has been shown to help reduce blood pressure and reduce blood clots. Consult your physician if you take blood thinning drugs as taking both may thin the blood too much. Nattokinase is drug free and totally natural unlike Warfarin (coumadin), Apixaban (Eliquis), Dabigatran (Pradaxa), Edoxaban (Savaysa) and Rivaroxaban (Xarelto). Our Nattokinase, unlike many synthetic versions on the market, is genuine Japanese, naturally fermented with extremely low levels of Arsenic, Heavy Metals including Mercury. 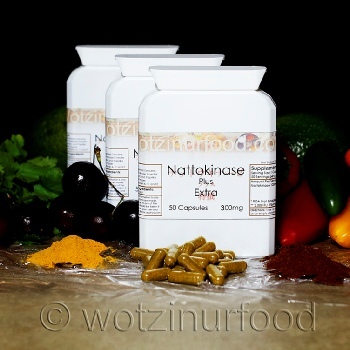 No chemicals or solvents are used in the production of Wotzinurfood Nattokinase Powder. Turmeric is a powerful anti-inflammatory and a very strong antioxidant. It fights free radical build up in the body, and boosts the activity of the body’s own antioxidant enzymes. It boosts endothelial function, which helps fight against heart disease, and regulates blood pressure, blood clotting and various other factors. It has been effective in the fight against tumours, and with the help of black pepper and cinnamon, controls and may reverse the free radicals that may lead to certain cancers. It can also help with arthritis and joint pain, and fight against depression and ADHD. Black pepper contains a good amount of minerals like potassium, calcium, zinc, manganese, iron, and magnesium. Potassium is an important component of cell and body fluids that helps controlling heart rate and blood pressure. Manganese is used by the body as a co-factor for the antioxidant enzyme, superoxide dismutase. Iron is essential for cellular respiration and blood cell production. It has also been found that piperine can increase absorption of Nattokinase, selenium, B-complex vitamins, beta-carotene, and turmeric, as well as other nutrients from the food. Paprika is very high in Vitamins A and E, both of which are very beneficial to heart health and is useful for regulating blood pressure reducing the risk of atherosclerosis, heart attacks and stroke. It is also beneficial for repairing wounds, keeping your eyes healthy and can reduce the risk of some cancers. Parsley is high in Vitamins K, Vitamin C and Vitamin A which are rich sources of anti-oxidants and are useful for regulating heart health, cancer prevention and arthritis. It is also helpful in protecting against conditions like diabetes, colon cancer, atherosclerosis and asthma. Our specially designed Vitamin C containing Acerola Cherry, Coriander, Cinnamon, Rose Hip and Dulse is also included to help boost the heart healthy 'Extra' ingredients.